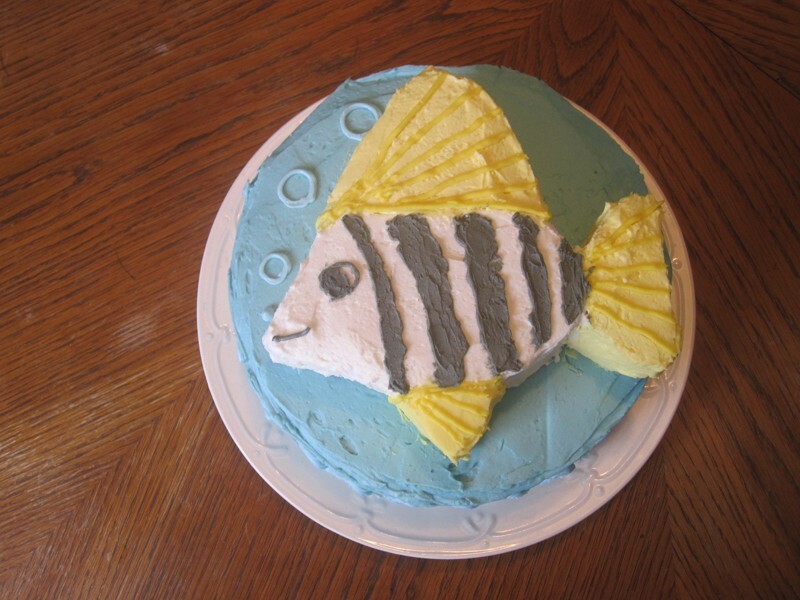 When I asked Pokado what she wanted for a birthday cake, she didn’t hesitate to say a fish cake. We looked on Pinterest for ideas and she gravitated towards all the Nemo cakes, but I didn’t really want to do a Finding Nemo theme so I refined the search a little to keep it more focused on ocean-y things. There are a lot of really neat cakes out there, I must say! 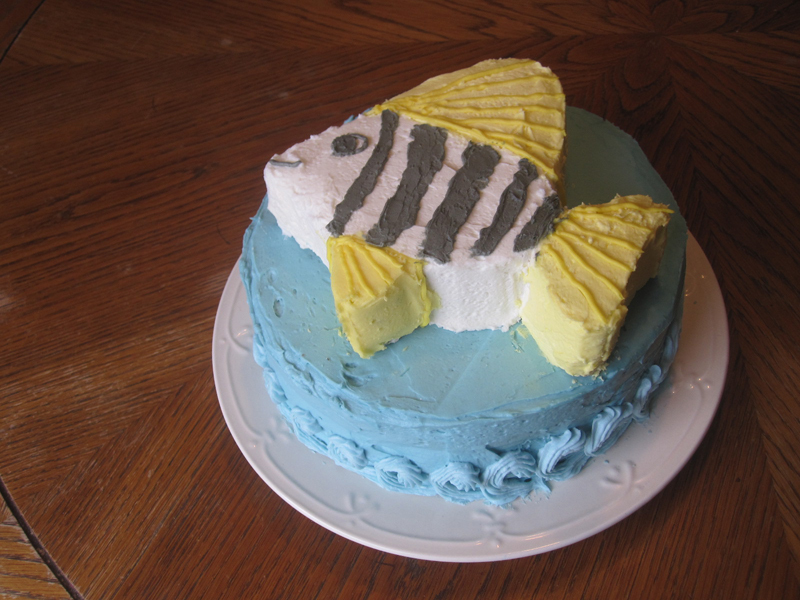 And so I found a picture of a tropical fish that I liked with a shape simple enough I felt confident I could cut it out of cake. I also found a tutorial on how to cut shapes out of cake, because I’ve never done that before. It was a little intimidating, but I know my cake recipe and how it handles (I’ve used the same recipe for chocolate cake since I was 12), which helped. I felt it came off well, given that my goal was spending no more than 3 hours on assembling and decorating. As a perfectionist it’s waaaaay too easy to get caught up in all the little details and never be happy with the result. I tried not to do that this time! I’ve been using up my wool stash, but with a couple exceptions I only have one skein (or less) of any given color. This means little projects, like over-the-ear headbands! I started out by making two for the girls, and I have others in the works for the Etsy shop (whenever I get around to opening it up again, that is). First we have the brown one I made for Squeaky. 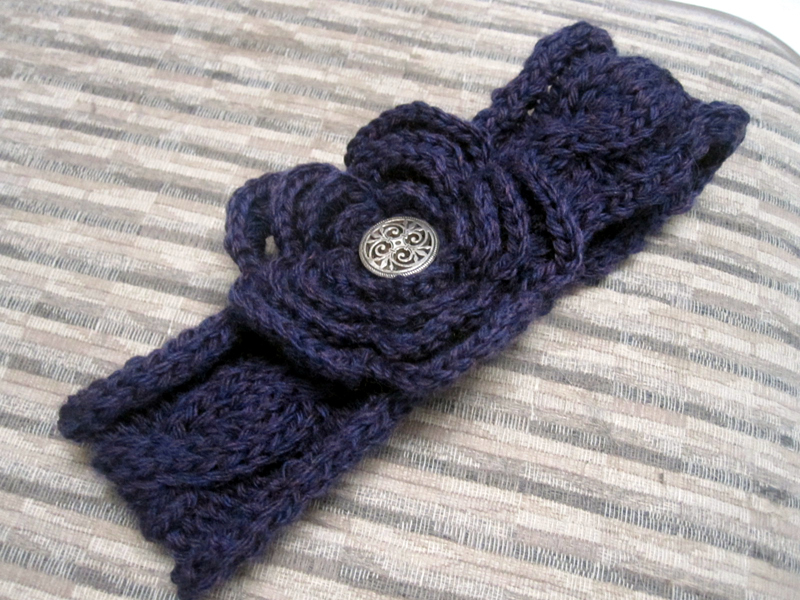 An easy crocheted wide band with a flower embellishment I made up myself. Somebody else out there probably has already done it, but I feel accomplished knowing I spent over an hour figuring it out on my own! 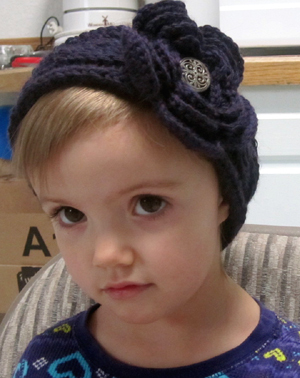 Next we have we have the purple knit headband for Pokado. 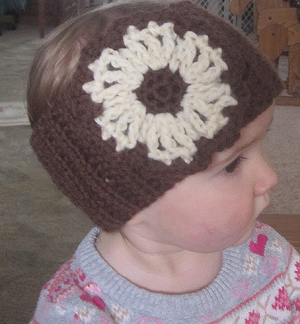 It was inspired by a headband one of my sister-in-laws has, and I think it came off rather well. If I do more in the future I may tweak the flower a little. It’s Irish crochet, but it’s a little fairly open Irish crochet and I’m not sure how it’ll work long term. Time will tell! Last week I purposed to used Twitter a little more, with a starting goal of one tweet a day. So far so good! Purposing to use Twitter more. One tweet a day, for starters. Squeaky kept everyone up most the night fussing about nothing, then went and woke up bright and early at 6:30. I want a nap already. The 4 year old watched me play FFVIII for all of 10 minutes and then started making suggestions for party members and battle strategies. And so the wooden play frying pans have graduated to tennis rackets for use with the big bouncy ball. Surprised it took this long, actually. I do enjoy myself some enchiladas, but I’m not always (read: hardly ever) in the mood to take the time to make traditional, rolled up tortillas of cheesy goodness. For years I’ve taken the layered-casserole approach (a layer of enchilada sauce, a layer of tortillas, a layer of desired filling, repeat until casserole dish is full then bake. Much faster, and just as tasty. And THEN, back around Thanksgiving I had another breakthrough. One of my sister-in-laws made an awesome turkey tortilla casserole, and the method of it inspired me to try making easy enchilada casserole even easier! I’ve done it twice now with happy results, so I’m sharing it here. I will still do the layering method on occasion, because it’s not that much more work and it looks pretty, but for those nights where I want dinner in the oven in 15 minutes and out of the oven half an hour later, this is the new Thing. 1) Pre-heat oven to 375° F.
2) Mix together all ingredients in a large bowl, then transfer to a 9×13 baking dish. Sprinkle top with extra cheese. 3) Bake 30-45 minutes, or until the casserole is bubbly and slightly browned on top. Allow to sit 10 or so minutes before serving. I made my own enchilada sauce (recipe below). I used 3 jumbo flour tortillas because it’s what I had. I would guess equivalents would be 6-8 corn tortillas or 4-5 standard flour tortillas. 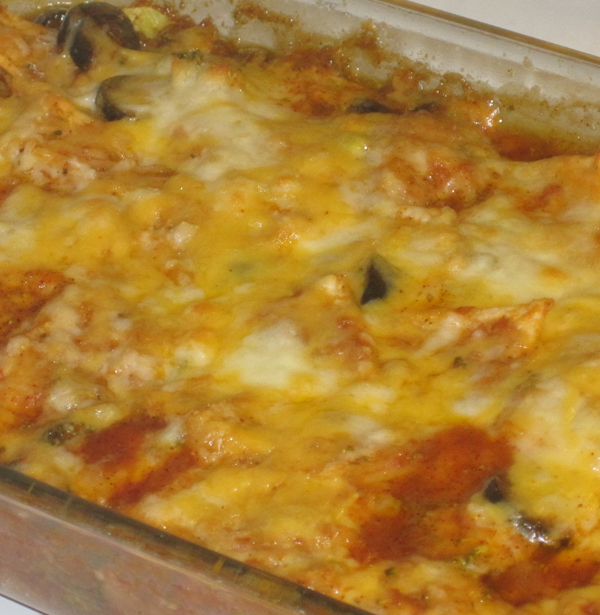 The casserole pictured has olives, corn, and broccoli added to it. I didn’t have any meat on hand or I would’ve thrown it in too. I used sharp cheddar cheese and mozzarella (again, because that’s what I had on hand…I know mozzarella isn’t really Mexican flare, but oh well). My oven seems to cook faster than a lot of recipes call for. I don’t know if it’s the altitude or what, but I automatically shave 10-15 minutes off of recommended cooking times. This casserole is usually done in 20-30 minutes for me. I’m very particular about my enchilada sauces, which I suspect is why I usually prefer to make own. When I buy it, I like La Victoria’s Verde Enchilada Sauce, but that’s, you know, green and a completely different flavor than your traditional red enchilada sauce. I often make red enchilada sauce on the stove, but for this casserole I experimented with just using a blender due to having an abundance of canned tomatoes but no tomato paste or puree. It was a little different, but worked well for the task so I’ll definitely be doing it again, methinks! 1) Place all ingredients into blender and pulse until smooth. Quite literally, actually. A tenacious cold has wreaked various havocs with our little family for over a week now, and I’m ready to be Done With It. For my part it never became particularly nasty, but it lingers and saps enough strength in a day to make productivity a thing of hopes and dreams. 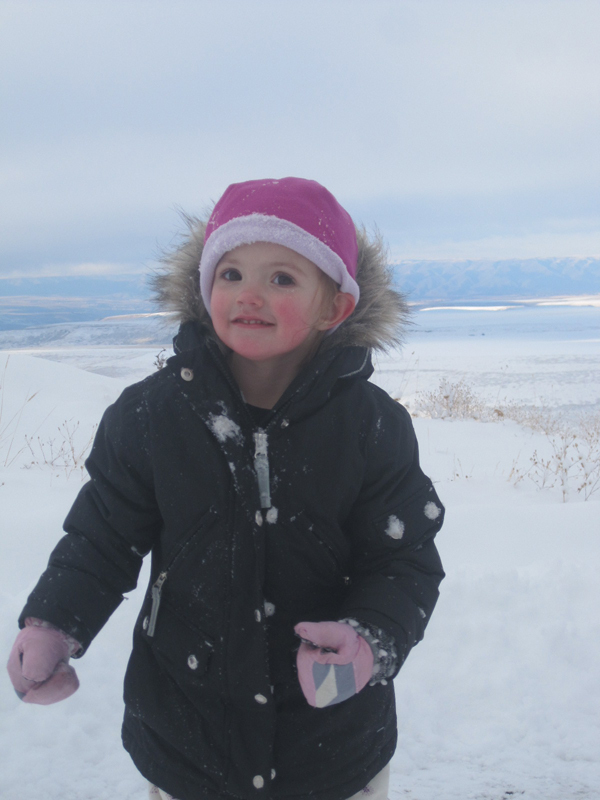 Unless your goal is to play in the snow as much as possible, in which case even a cold can be forgotten for a while. Seriously though, as I set about preparing for the party (which occurred this afternoon), I realized that it was good the weather allowed for it earlier in the month. Another week or so and I doubt I would’ve been able to pull it off between the cleaning, the food prep, and the mindset that goes along with opening your home to a group of people. I love hosting events, but I think I’m done now until after the baby arrives. With the possible exception of a birthday party for Pokado, because she’s been asking for a birthday tea party and is so excited that she’s turning 3. Some things you just can’t say no to! 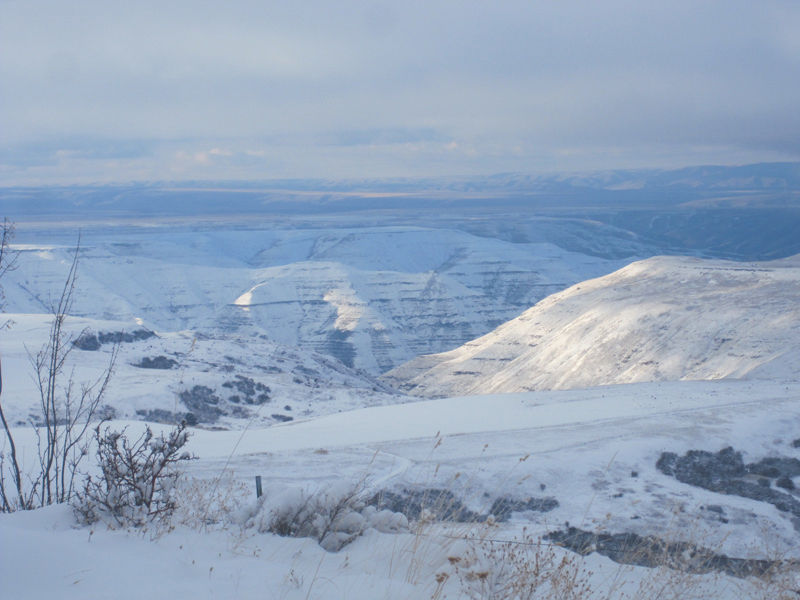 Greetings in the New Year! My activity online and on my blog specifically has been much, much less than I’d hoped for the last few weeks, but it was time well-employed and wonderfully spent. Christmas parties! Christmas! Christmas recovery! New Year Parties! New Year recovery! I crocheted a Christmas stocking! Next time I will at least reference a pattern, because I’m unhappy with the square heel and the fact that the foot is so much wider than the neck part of it. I know what happened on both issues, but I was in a hurry and decided not to go back and fix it. 😛 Lazy me. 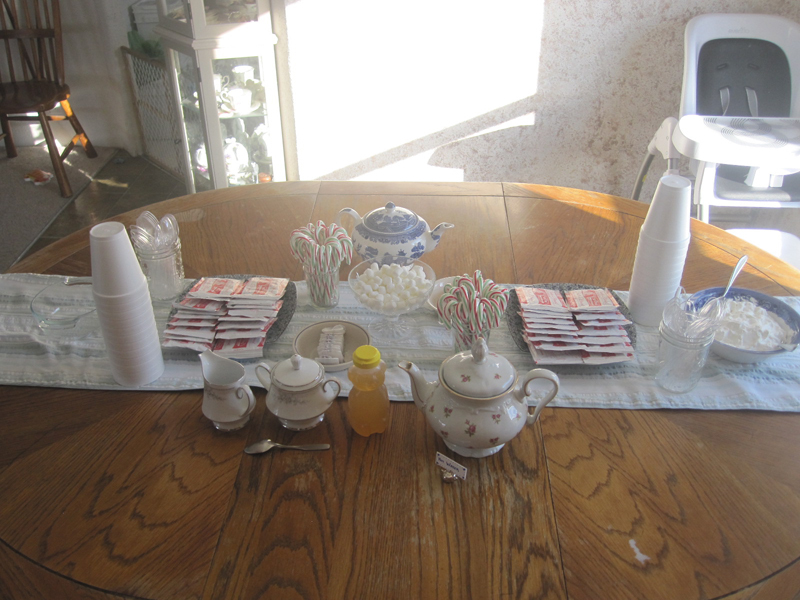 We went to a gingerbread house building party/contest and had great fun! The Dearliest and LK took on one house, Pokado and myself the other. The judges (not knowing who built which house) said The Dearliest’s house was built by a master architect and mine was where the rich people lived. We laughed with great amusement at both descriptions. After a couple days of munching on them, the houses moved up in our little cabin, where they await their fate. Last I heard The Dearliest was curious what would happen if they met with a shotgun. He has one week left to experiment, then I get to throw them out! Here we have Pokado making ginger molasses cookies for her great-grandmother, who loves ginger. She loved rolling the dough in sugar but hated it when the sugar got on her fingers. Quite the neat freak, that one! Christmas poses! LK and Pokado were highly mischievous that day, and I couldn’t get Squeaky to look at the camera for anything. Then I discovered a new setting on my camera that focuses on whatever color you want and greys out the rest. Cool! 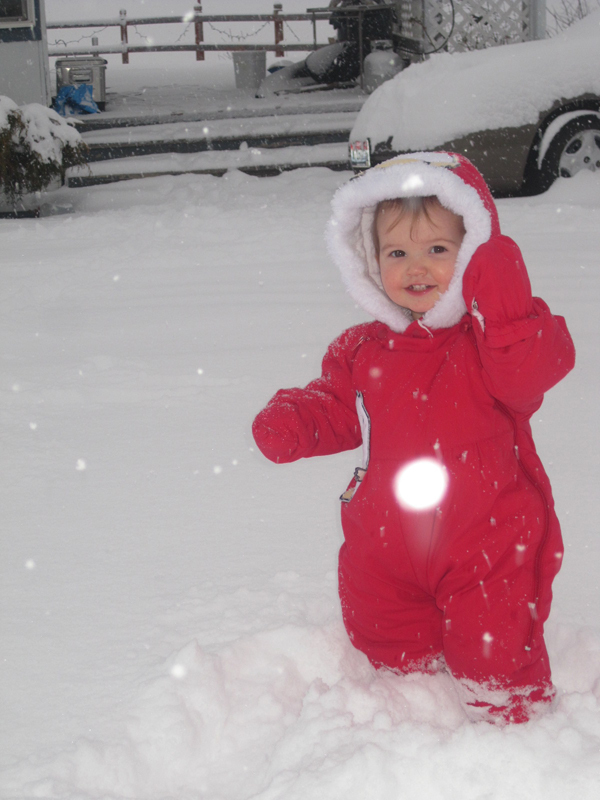 And, of course, snow. 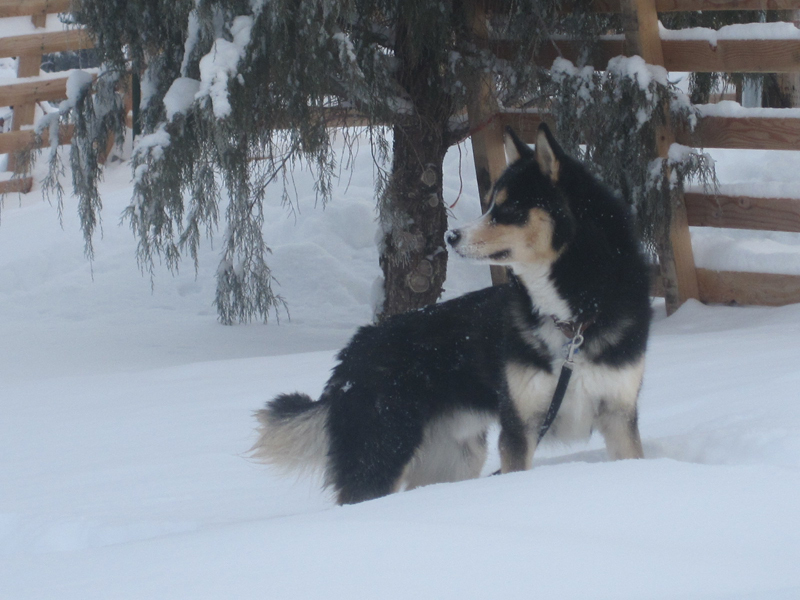 Timber got some pull time with the kids on the sled, but I don’t think I have pictures of that. I was watching from the warmth of inside, as I prefer to NOT go outside when it’s below freezing. Now that the new year is year I’m turning my thoughts back to Operation: Emerald (patchwork quilt), which is about 75% done. I’m also working on Pokadoo’s birthday present (the girl is going to be 3!! 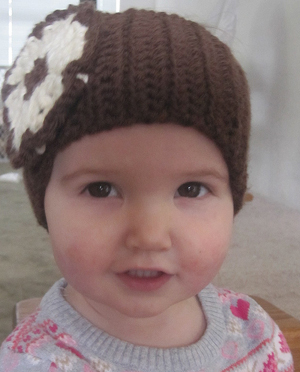 ), inspired by a pattern I found on Pinterest for a head/ ear warmer. It goes well, although I had to laugh the other night when I held it up at the end of a suspense movie. 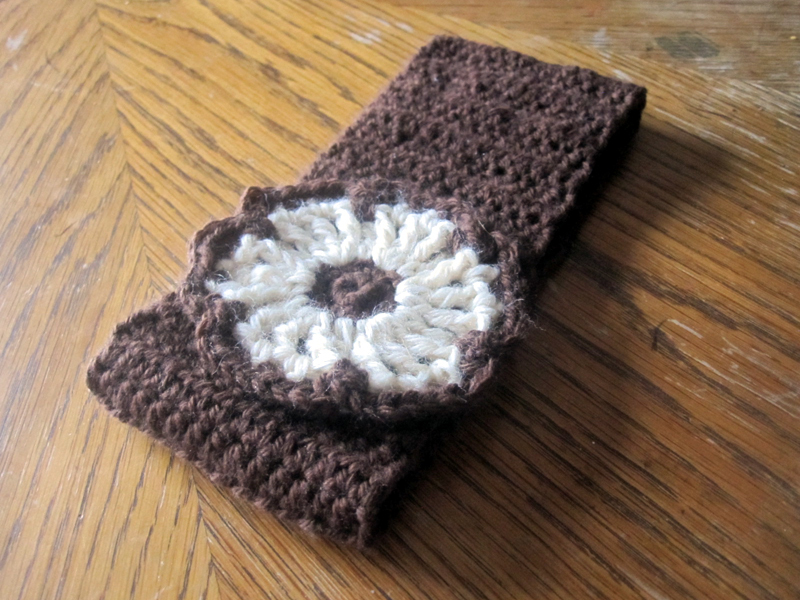 About 6″ of crochet work is getting pulled out because the stitches are so tight I lose about 1/4″ in width. Guess I can’t crochet during more intense movies! I hope you all had a wonderful Christmas and new year, and I look forward to what the next year holds!